This year, NBC 7 Investigates' team brought to light attorneys who preyed on immigrants, a charity founder who took advantage of children with cancer, the misuse of handicap placards and much more. Here, we highlight the 2015 investigations that brought about change in San Diego. 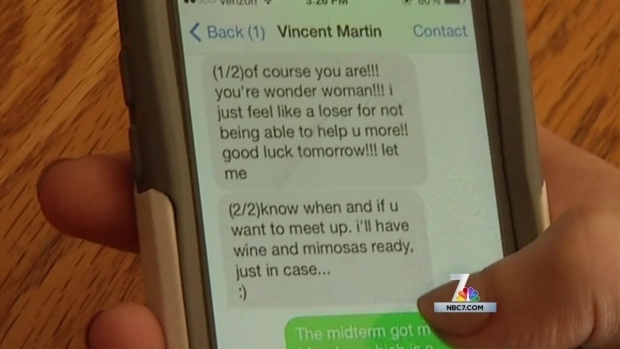 SDSU professor Vincent Martin is accused of sending hundreds of suggestive text messages to a young female student. He continues to teach at the university, despite violating the state education code. NBC 7 Investigates’ Mari Payton shares the story on April 23, 2015. In this series, NBC 7 Investigates exposed a college Spanish professor with a history of sexual harassment at San Diego State University. The investigation revealed that despite the university having knowledge and coming to the conclusion Vincent Martin violated the state education code, he was still teaching and consulting students. The seven-month investigation led to open records law fights in California and Delaware. The team's persistence led to the release of documents detailing Martin had a similar past with students while teaching at the University of Delaware. This investigation is a great example of tried and true reporting techniques: The team used the California Public Records Act to uncover the extent of the professor's behavior which included Martin suggesting a student wear a “French maid outfit.” An extensive background check into Martin’s past led the team to a former coworker who said Martin benefited from a cover-up of similar unprofessional activity at UD and was allowed to leave quietly. SDSU refused to discuss Martin’s case or release documents related to his discipline. 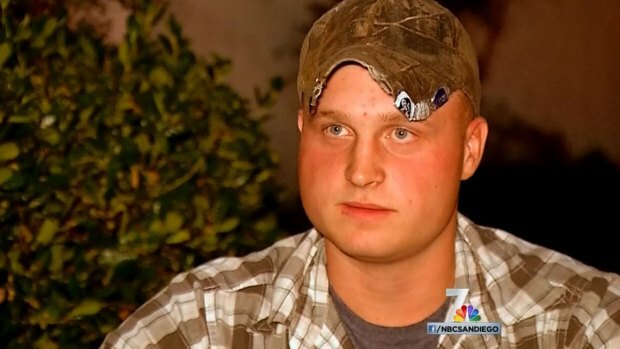 NBC 7 Investigates appealed the decision to remain silent and won. Through the Delaware Freedom of Information Act, the team requested similar information, and those requests were denied. NBC 7 Investigates' work to attempt to obtain this information was highlighted by news organizations in Delaware and is being used as an example for greater transparency. San Onofre – A Nuclear Problem? 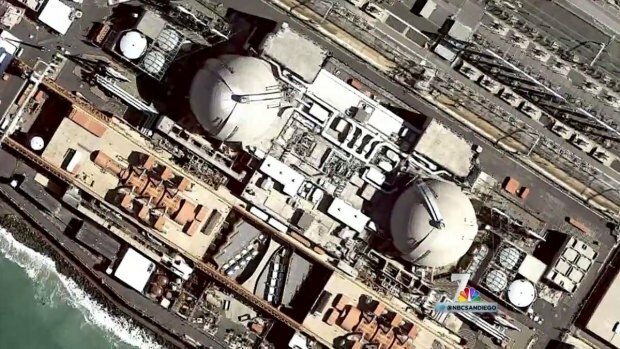 NBC 7 Investigates received a copy of two documents the utilities have provided the team negotiating on behalf of the government in the San Onofre nuclear plant shutdown. NBC 7 Investigates' Mari Payton reports. As regulators debate over what to do with decommissioned nuclear material inside the San Onofre Nuclear Generating Station, the NBC 7 Investigates team uncovered a history of “sloppy” handling dating back to the 1980s. The story began with a federal Freedom of Information Act request and developed into a series uncovering how the utility companies managing the nuclear plant disregarded compliance guidelines and were meeting in private with the federal government in order to be let out of their lease of the property years before it is set to expire. NBC 7 Investigates had to develop relationships with sources involved with these meetings in order to get a glimpse inside the negotiations and have a clear understanding of what will happen next with the property. The team also had to navigate the FOIA and fight for access to public documents to expose never-before-seen details about what type of impact the plant and nuclear material inside was having on the environment. After the first story aired, one of the utility companies went into damage control, trying to fight the facts in the story. By doing so, it led NBC 7 Investigates to the next story, in which the team was able to highlight the lies and attempted cover-up techniques the company used to create an incomplete glowing review of the condition of the property, and essentially lie to the U.S. Navy and federal government. The family of a San Diego girl diagnosed with cancer says a local charity, WishWarriors, took advantage of their situation and made false promises. Months of digging by NBC 7 Investigates led to the arrest of the charity’s president and CEO on July 3, 2015. NBC 7’s Candice Nguyen reports. It started with NBC 7 Investigates hearing concerns from a local family with a daughter battling cancer, but this investigation quickly developed into a story of fraud resulting in a criminal conviction for the CEO of a San Diego cancer charity. 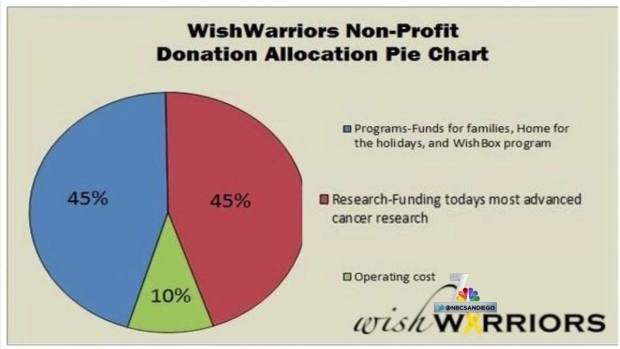 WishWarriors, and particularly CEO Brianna King, promised families with children battling cancer financial support for allowing the charity to highlight them in advertisements. Months after these promises and after the families participated in time-consuming fundraisers, none of the families had received a penny. As reporters and producers looked into King’s past, a long criminal history was uncovered, including active warrants for her arrest in several counties. Immediately after airing, the stories created impact. King was arrested in connection with one of the active warrants. The charity was forced to look into their financial situation and found all of the money raised was gone. The San Diego District Attorney began investigating, and King was charged with embezzlement and grand theft. Communities rallied behind the families impacted, raising money to help pay for medical costs. The charity has ceased all operations, and in December, King was sentenced to a year in jail for grand theft. NBC 7 Investigates caught a county and city employee parking for free in a 6-month undercover investigation. NBC 7's Mari Payton reports. Our cameras caught city and state employees illegally using handicap placards for months in order to obtain better parking spots. 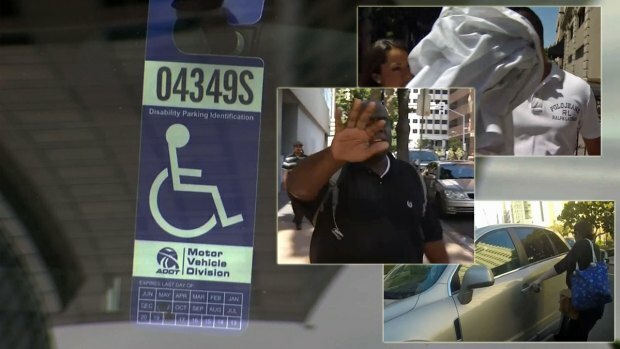 After our story aired, the San Diego City Council approved a new law increasing the penalty for people caught abusing handicap placards. The new fine is $740, up from $452.50. The city council also approved another ordinance cracking down on handicap placard abuse. This new law classifies placard abuse as a parking violation, instead of a criminal misdemeanor. Doing so will allow parking enforcement officers, not just police, to issue citations for placard misuse. Airport IDs Getting Into Wrong Hands? From March 2013 to March 2015, NBC 7 Investigates found 276 ID badges from Lindbergh Field employees or contractors were reported missing. Could those badges – which allow access into even the most secure areas in airports – get into the wrong hands? NBC 7 Investigates’ Mari Payton reports on May 20, 2015. From March 2013 to March 2015, 276 ID badges from Lindbergh Field employees or contractors were reported missing, NBC 7 Investigates found. More than 20 of those ID badges were missing for six days or more before they were reported. In one case, eight months went by. Our NBC station in Dallas found that thousands of IDs were missing at airports nationwide. After the investigative stories aired, new security badges were issued at airports across the nation, including Lindbergh Field. Also, in December, The U.S. Senate Commerce Committee approved legislation aimed at tightening screening for airport workers. New data shows that suicide attempts by juveniles in San Diego County detention facilities has more than doubled, increasing each year since 2011. But, why? NBC 7 Investigates' Mari Payton shares the story. In September 2013, Rosemary Summers, 16, was serving time in the Kearny Mesa juvenile hall facility when she committed suicide by hanging herself. In a lawsuit against the county, the family alleges County of San Diego’s Probation Department employees, who work in the facility, made some very serious errors. NBC 7 Investigates revealed data from the state corrections agency that shows suicide attempts by juveniles inside San Diego County detention facilities have increased each year since 2011. The California Board of State and Community Corrections reports there were eight suicide attempts at San Diego County juvenile hall facilities in 2011. That number went up to 11 in 2012 and then more than doubled to 25 attempts in 2013. After our story aired, San Diego County agreed to pay Rosemary’s family $1 million and is making changes to help prevent future deaths. The changes already made include cutting the doors to the juveniles rooms in half so that unless they are changing (or there is an instance where privacy is needed), the top half of the door will remain open; removing the large door hinge which caused the doors to shut automatically; and covering up vents in the rooms. Former clients of local immigration attorney Christopher Macaraeg claim his failure to properly handle their cases has caused them significant problems with the immigration system. NBC 7 Investigates' Mari Payton reports. According to the State Bar of California, a San Diego immigration attorney failed to perform important legal work for his clients and put them at immediate risk of deportation. Christopher Macaraeg is accused of repeatedly missing court deadlines, prompting judges to dismiss his clients' cases. According to the charges, Macaraeg also failed to inform clients about those dismissals, disobeying court orders and practicing law without a license after the state bar suspended his license for 60 days in December 2014. The Notice of Disciplinary Charges was filed three weeks after NBC 7 Investigates revealed several of Macaraeg’s former clients sued him in small claims court for mishandling their immigration cases. The San Diego County Bar Association also said our stories helped educate the public on how to find qualified immigration attorneys. NBC7 Investigates with Mari Payton reports on the more than 200 people missing from San Diego – some for decades. This year alone in the city of San Diego, nearly 1,000 adults have been reported missing. NBC 7 Investigates launched “Searching for San Diegans,” a searchable database online where you can see who is missing and learn details about each person. The database updates weekly. After we aired our story and launched the database, the number of possible sightings and tips increased. Robin Burton has been searching for her mom who went missing from San Diego in 1998. She wrote NBC 7 Investigates stating there was an increase of tips on her mother’s possible whereabouts. “All of this is because you aired my mom's story. I'm praying for a miracle," she said. National City police are investigating a situation in South Bay where a woman said she gave another woman who she thought was an attorney a few thousand dollars for legal help with her family's immigration status. NBC 7's Wendy Fry has what's been learned about that woman. NBC 7 Investigates revealed a South Bay woman’s alleged plan to pose as an immigration attorney in order to take advantage of undocumented immigrants. A.J. 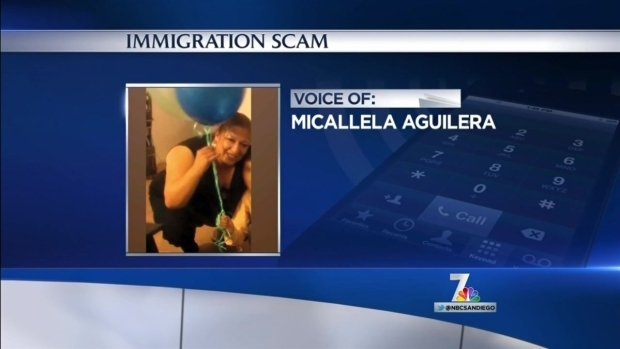 Aguirre first told NBC 7 Investigates about her interactions with Micallela Aguilera in February. Aguirre said Aguilera approached her family at church and offered her legal help. The family gave her $3,000 but later discovered that their so-called attorney had filed no paperwork with immigration officials. Aguilera was arrested in April on fraud charges, and she has been convicted on similar charges in Tulare and Orange Counties, according to a National City Police fraud detective. After hearing complaints from a local service member’s mother, NBC 7 Investigates began digging into the payments made to Romano’s Jewelers by Marine Jacob Helmuth, who was not told a gift for his mother, on which he was making payments, would come with a 29.9 percent interest rate. Though the investigation began in late 2014, NBC 7 Investigates followed the story through 2015 as a Romano’s employee, district manager and owner were charged with conspiracy and identity theft charges. Romano’s eventually closed down several Southern California locations after filing for Chapter 7 bankruptcy. NBC 7 Investigates reporter Candice Nguyen spoke to San Diego experts who say there is an underground industry of untrained, unlicensed security guards putting the public at risk. 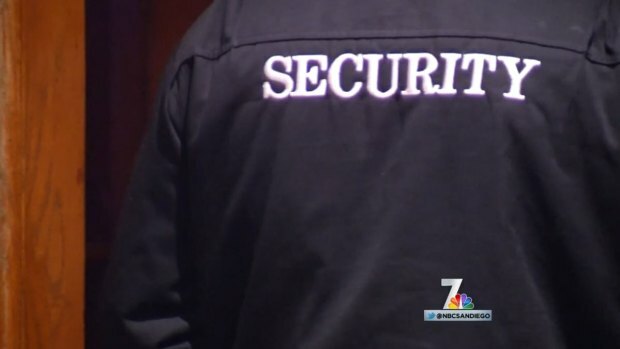 An NBC 7 investigation in February uncovered an “underground industry” of unlicensed, untrained security guards and bouncers in San Diego County. According to one expert’s estimates, about 70 percent of security officers are not licensed properly. However, in California, nearly everyone working in the security industry must be licensed. NBC 7 Investigates’ reporting inspired state legislation, authored by Assemblyman Jim Cooper (D-Elk Grove), that would have expanded the definition of a security guard to encompass anyone who wears a security uniform or performs security functions as their main duty. The bill, which earned unanimous support in the State Senate and Assembly, was vetoed by Gov. Jerry Brown. He said he was concerned the bill would create barriers to enter the industry. 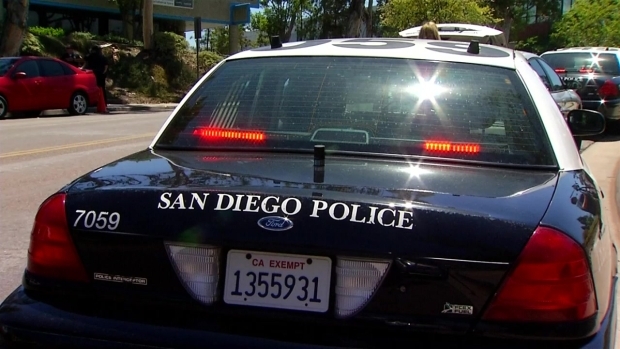 The city of San Diego's watchdog over police behavior is allowing officer misconduct to go unpunished and unreported while the board is hamstrung by politics at City Hall, according to former board members. NBC7’s Mari Payton reports. Two former members of the Citizens’ Review Board on Police Practices told NBC 7 Investigates that the group is hamstrung by politics at City Hall while officer misconduct goes unpunished and unreported. The women say the board has a “fixed” and ineffective review process. However, city and police officials argue that the systems in place keep the review board fair. After NBC 7 Investigates’ story aired, San Diego City Councilman Todd Gloria said the Citizens’ Review Board needs reform and more transparency. He hopes the city council will work with the SDPD and the public to recommend changes to the board, and then put those changes on the ballot in 2016.